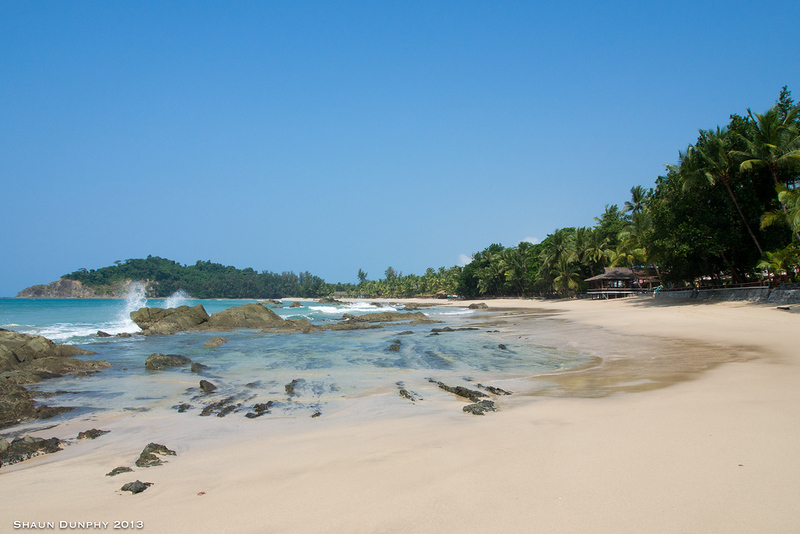 Ngapali Beach is a quiet, naturally beautiful beach town on Myanmar’s western coast. With beautiful blue water and stunning white sand beaches, Ngapali Beach is emerging as one of Southeast Asia’s best beach destinations largely undiscovered by mass tourism. While Thailand might get most of the attention as Southeast Asia’s beach destination, the stunning beach resort towns along Myanmar’s western coastline offer the same impressive natural beauty with far smaller crowds. 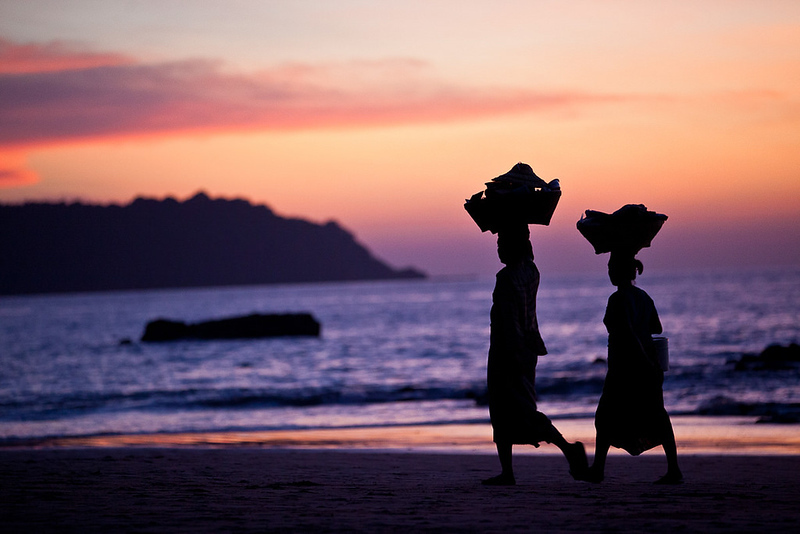 Although Ngapali Beach is Myanmar’s most developed beach destination, it retains a quiet and relaxing atmosphere compared to most of Southeast Asia’s well-known beaches. 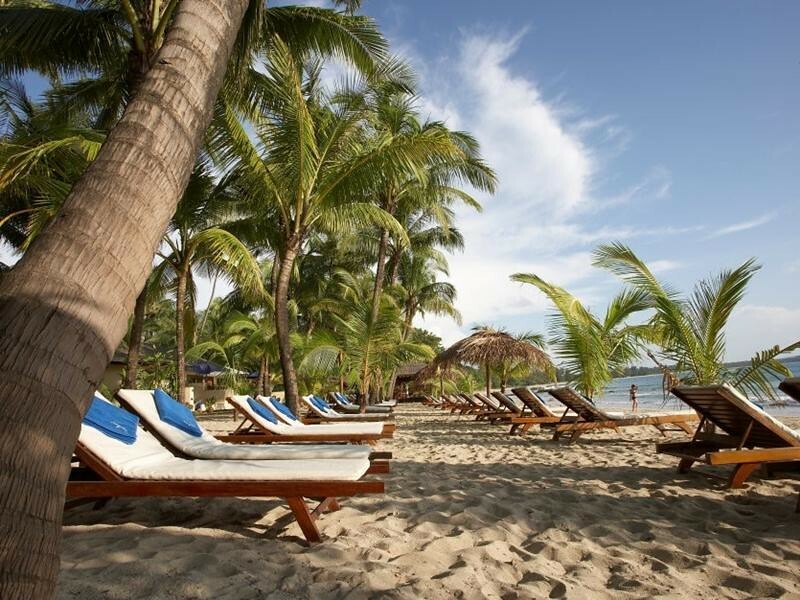 White sand, great snorkelling and a slow pace of life make Ngapali Beach a great place to relax. 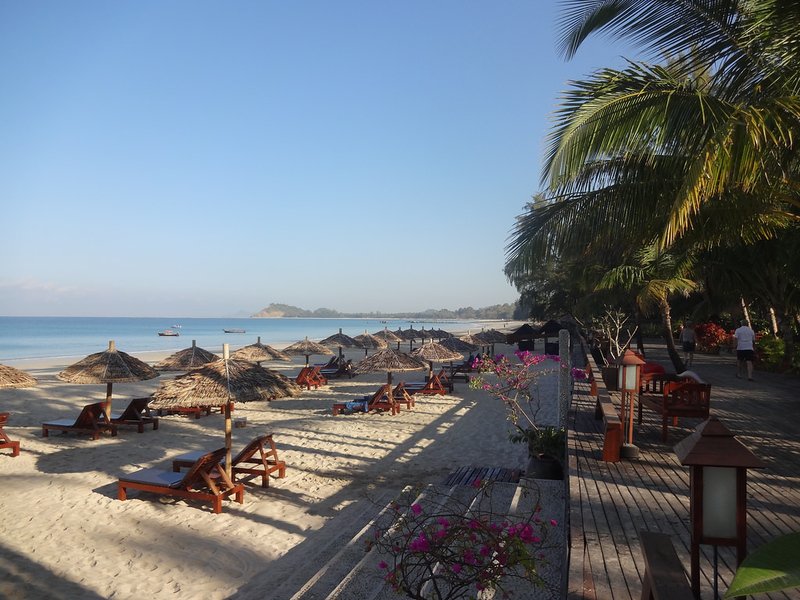 While Ngapali Beach is usually busy during the high season from November until February, note that some hotels and restaurants are closed from March or April until late October. Ngapali Beach covers stretches for three kilometres along the Bay of Bengal. The water is clear and the beach clean, quiet and beautiful, making Ngapali Beach one of the best places in Myanmar to relax and unwind. Most of the hotels and restaurants in the area are built directly across from Ngapali Beach, making the area easy to navigate. There are several motorcycle rental shops close to the beach, providing a cheap and easy way to get around the area as a tourist. Located near the southern end of Ngapali Beach, Jate Taw is a small fishing village. If you’re an early riser, you might be able to spot the fishing boats bringing their catch back to shore in the early hours of the morning. Located a short distance off the southern end of Ngapali Beach, Pearl Island is a popular day trip destination. Boats travel between the beach and Pearl Island frequently, making it easy to access during the daytime. Pearl Island’s clean, untouched beaches and clear water make it a popular snorkelling spot for people staying in Ngapali Beach. Located around six kilometres inland from Ngapali Beach, Thandwe is a small but important town on Myanmar’s western coast. Thandwe Airport, which is located closer to Ngapali than Thandwe itself, is where you’ll arrive if you’re travelling to Ngapali by air. Quiet and peaceful, Ngapali Beach is a great place to sunbathe, enjoy a great book or simply sit back and let the world go by. Loungers and umbrellas are set up along the beach for resort guests and visitors — if you’re staying by the beach, ask your hotel staff for recommendations. The clear, warm water at Ngapali Beach makes swimming off the beach a fun way to cool off after sunbathing. Pearl Island, which is located just off the beach, is another great beach area for enjoying the sun and clear water. Largely undeveloped and untouched by mass tourism, the water around Ngapali Beach is clear and full of sea life. Snorkelling off the beach is possible, although the fish are rarely particularly large or impressive. For a better snorkelling experience, book a snorkelling tour or charter a boat to travel out to Pearl Island. The clear, warm water around the island is great for snorkelling and exploring the local beaches. Boat trips are available to Pearl Island, local fishing villages and other destinations along the coast of Ngapali Beach. There are several travel agencies in Ngapali that can arrange boat trips, or you can charter a boat from the beach for your group. Note that if you charter a boat, you’ll be expected to book it for the entire day. Fishing trips to several islands and fishing locations off the coast of Ngapali Beach are also available. Ngapali Beach’s nine-hole golf course — it’s actually an 18 hole course, but poor maintenance means most of the course is off limits — is a fun place to spend a morning. Plan your game for early in the morning to avoid the midday and afternoon heat and humidity. Located right on the beach, Amara Ocean Resort is a luxurious five-star resort that’s ideal for visitors that want to enjoy the sun and sand. 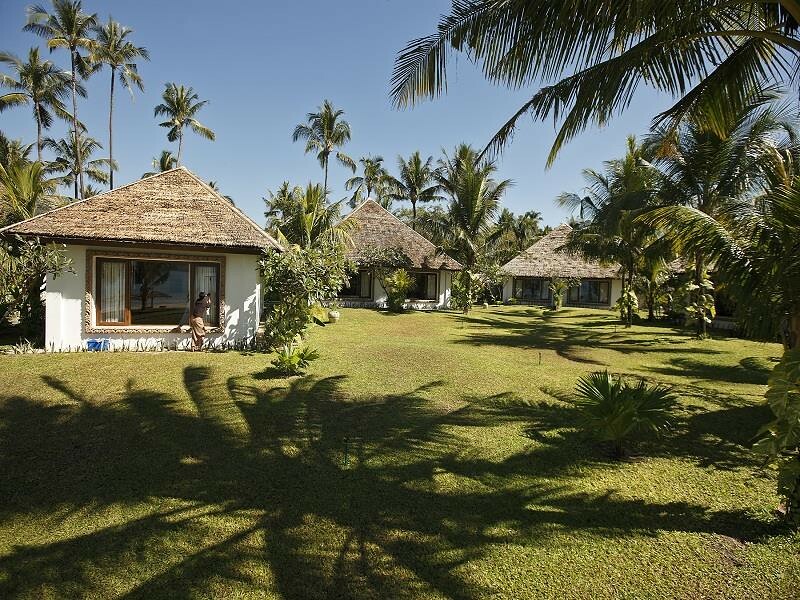 Rustic decorations and fantastic views over the ocean make the beachfront bungalows a wonderful place to relax. 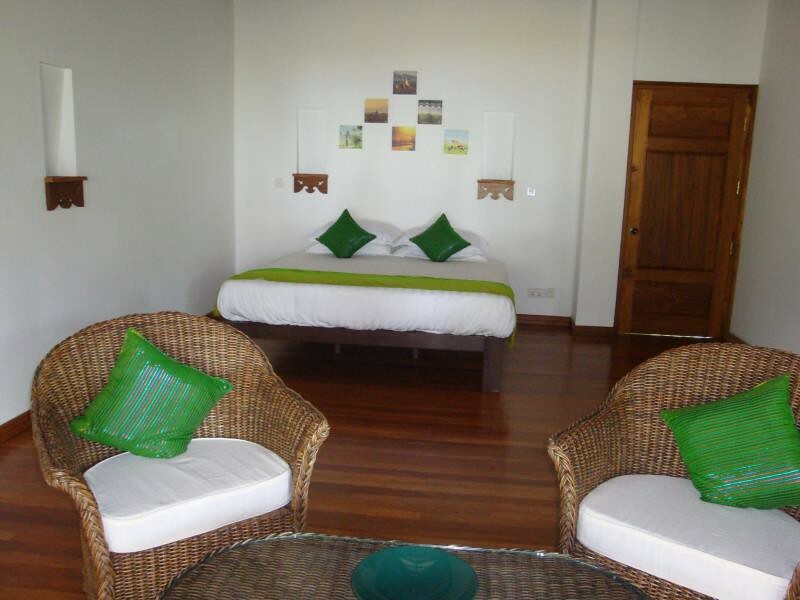 Ngapali Bay Villas & Spa is an upmarket villa resort located near Thandwe Airport and right beside the beach. The villas range from comfortable and cosy twins to spacious villas with private swimming pools. Opulent and palatial, the Hilton Ngapali Resort & Spa offers a selection of luxurious, modern rooms and villas with views over the Bay of Bengal. The hotel’s huge outdoor pool is a great place to relax and watch the sun set over the beach. Located close to Ngapali Golf Course, Bayview – The Beach Resort is a comfortable four-star resort that’s just a few steps away from Ngapali Beach. Beautiful beachfront rooms and a big outdoor pool make this a romantic, relaxing place to stay. Clean and comfortable rooms, great views over the beach and free Wi-Fi make Yoma Cherry Lodge a pleasant place to stay on Ngapali Beach. This three-star hotel is steps away from the beachfront, making it a convenient hotel choice for anyone seeking sun. 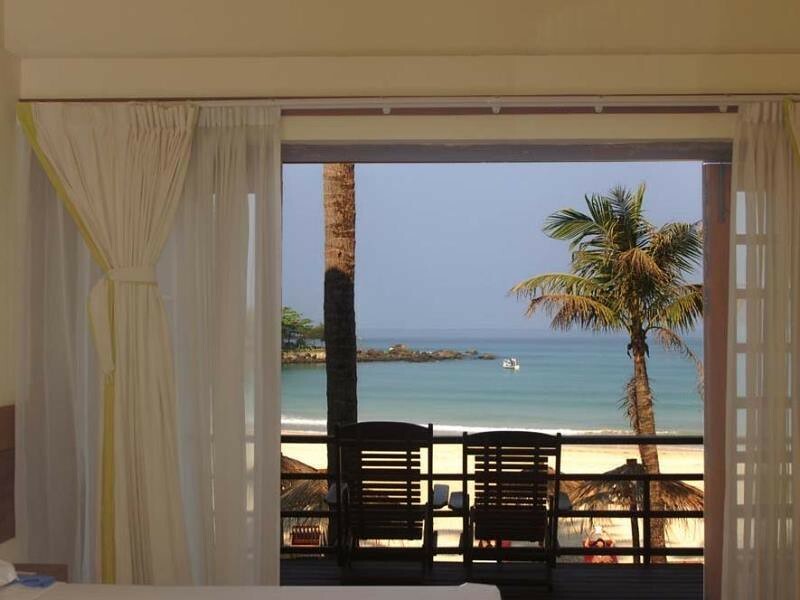 Pleasant View Resort is a rustic, comfortable bungalow resort located towards the southern end of Ngapali Beach. 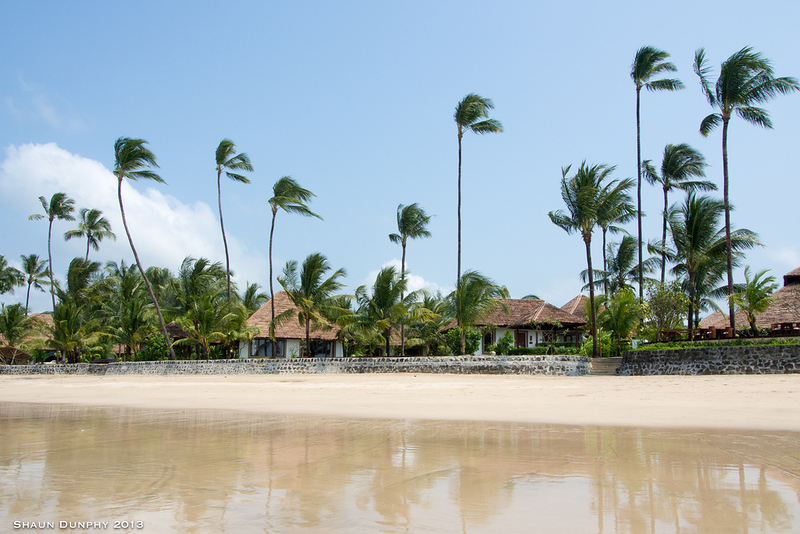 Many of the resort’s bungalows open right out onto the beach, giving guests immediate access to the sand. Located at the southern end of the beach, Diamond Hotel offers a good selection of clean and comfortable bungalows and villas. The hotel’s swimming pool and restaurant both offer great views over the beach and of the sunset. While Ngapali used to be a backpacker’s paradise with a great selection of cheap rooms, the area’s budget accommodation options are limited today. Most hotels start from $75 per night, making mid range hotels better value for money than the few available budget options. Large-scale demolitions took place during the 1990s to make way for the numerous high-end hotels that now line the beach. Rivertop Lodge, which is a short distance from the beach, has some of the cheapest rooms in the region, with bungalows priced from $65 per night. Ngapali Beach is famous for its fresh seafood, and Ngapali Kitchen is one of the best places in the area to sample fresh fish, high quality curry and other local specials. Another seafood restaurant, Golden Rose is located on Ngapali Road a short distance from the beach and most of the area’s hotels. A great selection of seafood dishes are available at reasonable prices. Located right on the beach and owned by a local fisherman, SILVER FULL offers high quality fresh seafood caught daily by the restaurant’s staff. Another beachside restaurant, View Point offers — as its name would suggest — great views of the Bay of Bengal. Drop by before sunset to enjoy a great meal on the beach and an excellent view over the ocean. Squid, shrimp, fresh fish and tasty curries make Maison de Mer another fantastic choice for dining on the beach. In addition to its seafood menu, Maison de Mer serves a good choice of local beers and cocktails. Located inside the Hilton Ngapali Resort, Shore offers tasty cocktails and excellent views over the beach in a luxurious environment. Thandwe Airport is located about eight kilometres north of Ngapali Beach and is a 10 minute car journey away from most of the area’s resorts and hotels. 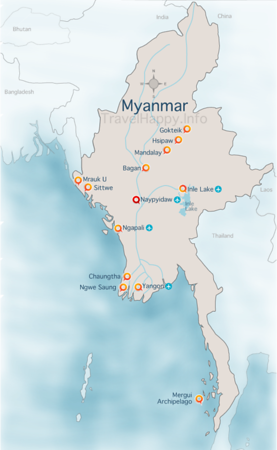 Daily flights connect Ngapali and Yangon — the journey takes about 50 minutes. Check Skyscanner to compare airlines for the best prices and flight times to Ngapali Beach. Ngapali Beach is accessible by bus from Yangon. The journey takes about 14 hours and can be quite bumpy and comfortable due to Myanmar’s road network. Most travellers to Ngapali Beach travel from Yangon to Thandwe by air due to the far shorter travel time.